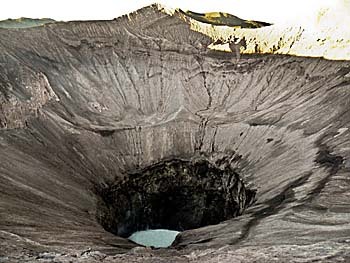 An so it looks when the passengers of the blasted vehicles have to leave them, 'cause they simply can't drive up the crater's edges. A typical Asian 'I was here' photo for everyone is due. This unavoidable, sterotype ceremony can easily last twenty minutes. In no time after it's on facebook. Mount Bromo is one of the great stars of the Indonesian volcanos and one of the most active ones in Java, though not that active as famous Mount Merapi is. 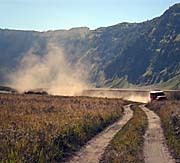 Most remarkable is the unique surrounding of Bromo. It looks rather as it would be part of a scenery of an Arabic fairy-tale. It's defenitely one of the most impressive landscapes I have ever seen. Gunung Bromo (2329m) has a couple of neighbours and they all are situated within a sand desert, which looks pretty much as it has been the bottom of a big lake in former times, but dried out. Bromo's neighbour Mount Batok looks on the first glance more impressive in it's outer appearance, for it's green colour and furrowed surface and it's almost perfect cone shape. Gunung Batok is also higher than Bromo is. 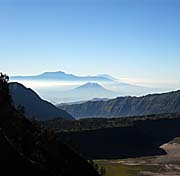 Though, Bromo is the star and the youngest of all the volcanos around. He had his last eruption in November 2010, which lasted until the end of January 2011. 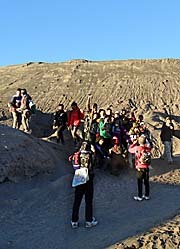 The thrill here is to walk up the 250 steps who lead to the edge of Bromo's caldera. It's an impressive look deep down into the steep hole which is connected to the inner of the earth. One can see the ground, where turquoise-coloured water is bubbling; from time to time steam clouds are coming up. Would be nice to have a walk around the caldera, but it's quite risky. Some parts one has to balance on the ridge of the caldera, and it's going steep down to both sides. No pleasant imagination to fall into the crater. Would be also interesting to have a look into the calderas of the two volcanos behind Bromo; but it's all steep and not easy to reach. By the way: the name 'Bromo' is derived from Brahma, one of the most important Hindu gods. Since the people who live around are members of the Tengger tribe, who are not Muslims but Hindus, there is a small Hindu temple (Pura Luhur Poten) placed at the foot of Gunung Bromo. In the remote valleys of the national park do still live some leopards, but they are seldom seen. View on the sand sea from the cliff's edge at Cemara Lawang (Image 1). In the early morning it's often misty; there is still mist to see on the photo. In rainy season it's reportedly often heavily raining. Supposedly the ground then fills partially with water. There is even a drain off leaving the sand sea. The following two images are starring Mount Bromo, who looks comparably inconspicious and harmless. Nevertheless, he is the 'tiger' among the volcanos in the group. The tiny image below shows the hindu temple at Bromo's foot. Well, yes, it's so small you don't see much on it. Image 5 gives us a look into Bromo's abyss. Boiling, bubbling, spitting, practically he can erupt at any moment again. Althougt the volcano is under seismological observation, he is feared for his sudden activities. Gunung Bromo and it's neighbours seen from the way up to (Image 6) and from Penanjakan viewpoint (Image 7). 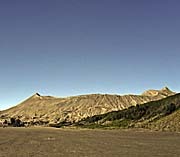 The green cone in the foreground is Mount Batok (2,440 m, the only inactive volcao of the group), left of it Bromo (2,392 m), the protagonist; behind him is a bigger volcano; it's Gunung Kursi (2,581 m); behind Kursi is the biggest of the four, bigger as the three first together; that's Gunung Widudarum (2,614 m). The tallest in the very background is Gunung Semeru (3,676 m), the highest mountain on Java. Every twenty of so minutes he puffs one of the clouds out which is to see right of the peak (blown away by the wind). 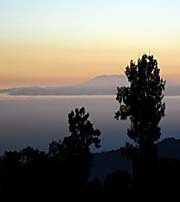 Gunung Semerung is no more situated inside the Tengger caldera but a few kilometers behind. Semerung is also active, dangerous, unpredictable. Image 8 shows the group again from Cemara Lawang, now in the evening. The last image displays Mount Bartok, actually in it's regular shape with all the deep wrinkles the most aesthetic. All photos taken in June 2012 by Asienreisender. If one sees the picture above it looks pretty much as the sand desert has been another former caldera of a much bigger volcano. I found this idea strengthened after a longer hike to the south and around the volcano group. It all looks like the caldera of a supervolcano of former times; compared to this the 'group of the four' appears small. Bromo, Batok and the others are comparable dwarfs. The cliffs and the mountains in the background were the inner border of the Tengger supervolcano. It looks pretty much as what one can see at Lake Toba on Sumatra. It wouldn't be a Javanese landscape if not Franz Wilhelm Junghuhn explored and mapped it. 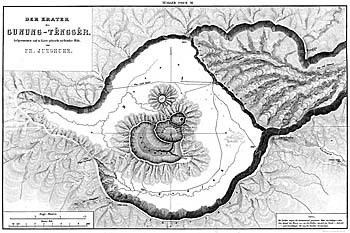 The genius created the splendid map in 1844 and published it in 'Javas Gestalt, Pflanzendecke, innere Bauart'. 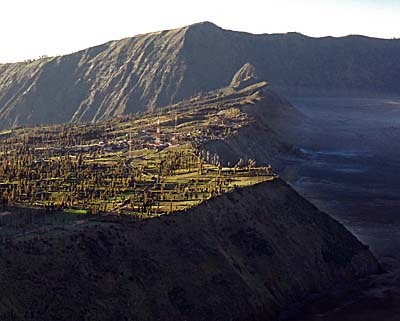 The genesis of the Tengger caldera evolved over earth historic times. About 820,000 years ago a huge volcano grew 4,500m high. In a huge outbreak about 150,000 years ago a first caldera got shaped. After the collaps of the first volcano five new volcanos appeared in the caldera. These second generation volcanos are far smaller than the first, Tengger volcano was. They appear now as mountains in the Tengger caldera, which diameter is about 16km and which is lowered 110m deep from the edges of the surrounding cliffs. After a long phase of inactivity two new volcanoes appeared at the caldera's southeastern edge. One of them is Mount Semeru, now the highest mountain in Java (3,676m). Since 1767 CE there are 60 eruptive activities recorded. In one of the youngest and unexpected outbreaks in 2004 two people got killed. Bromo is feared for it's unpredictability. 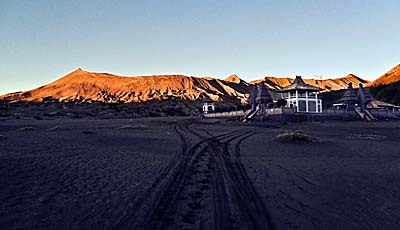 The village of Cemara Lawang close to Mount Bromo is a tiny spot on the map. From Penanjakan viewpoint one sees that it is situated in a great canyon. This canyon was in the past certainly formed by lava streams sliding downwards; comparable to the canyons at the foot of Mount Merapi; but this canyon is much bigger. What is now the canyon was a long time ago in earth's history the outflow of the Tengger supervolcano. Cemara Lawang is up at 2,300 meters altitude, therefore it's cool or even cold up here, particularly at nighttime. Temperatures can drop down to 0 degree celsius. What for a surprise in the tropes: normally it's always too hot, and suddenly it get's that cold! From the village to Mount Bromo it's an easy walk of just a few hundred meters. The village is situated at the edge of a steep slope. From this edge there is a great view over Mount Bromo and it's four neighbours and additionally majestic Mount Semeru in the background. The Tengger people around here are Hindus, and that has the great advantage of the absence of mosques. While in the verymost parts of Java nowadays mosques are everywhere (there were built thousands of new ones in the last years), they cause a heavy noise pollution five times a day and even at 4:30 in the morning. Usually one can't escape the din. In many cases one hears not only noise from one mosque, but from several mosques around. It's part of the urban design to make sure everybody get's to hear the holy message five times a day. Sometimes they have 'special events' on whose the Imam announces whatever for a long time via the loudspeakers. Needless to add that it comes always as noisy as possible. Well, up here it's much more quiet, and quietness is somewhat really precious. Something very seldom in our days. However, the Tenggerese are said to have been fled intruding Muslims in the 19th century; another theory describes their descent from the Majapahit kingdom, who's people also escaped intruding Muslim warriors, but already in the 15th century in accordance with the myth of the annual Upacara Kasada festival (see below). The Tenggerese live in 30 villages in and around the national park and their number is given with 600,000 people. 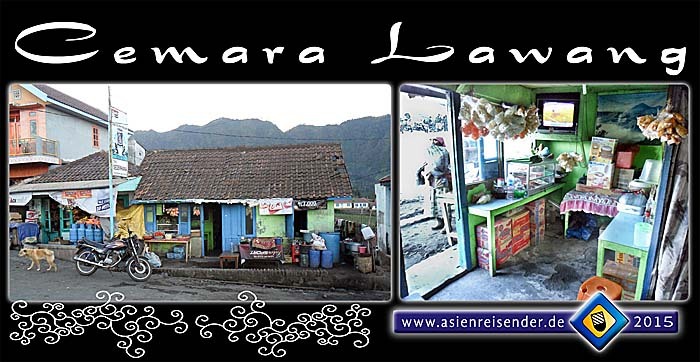 Cemara Lawang is, as a mere village, absolutely not remarkable. A few houses sticking on a slope with barely a single remarkable building. 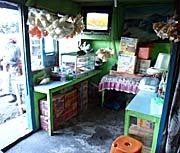 All the village's accommodations are heavily overprized, particularly in high season, what is from July to September. There is no tourist information here. The traveller is therefore depending on his guidebook or on the information given by the host of the guesthouse or the tour guides. Since the people here are thoroughly unqualified for anything but having only money in mind, valuable information is poor. Sometimes other travellers can give advice based on their own experiences. The approach from Probolinggo wasn't the easiest. At the first afternoon, after arrival there was no bus anymore up to Cemara Lawang. Next day I waited the whole forenoon, but there were still not enough passengers to make a van go. Hitch-hiking proved very difficult, but at least someone took me and another traveller for a high price with them up to the mountains. There is a spectacular view already from Cemara Lawang on the volcanos, but the best views one get's from a viewpoint on the neighbouring mountain chain. It's called Penanjakan view point (2,770m). Following the small road from Cemara Lawang it's soon later a climb up a small path. A number of viewpoints offer views with different perspectives over the grand panorama. Later one reaches an asphalt road which leads up to Penanjakan. From there one has views to both sides, the volcanos (south-south-west) as well as to the northern direction. Villages are to see as well at the horizon, one of them might be Wonokirti. Except Cemara Lawang the wider area around the volcanos is completely free of settlements, what makes part of the surroundings charme. On the way back one can follow the asphalt road, which leads down to the sand desert; from there it's easy to reach Cemara Lawang again, passing by Mount Bromo. The whole trip is about 25 kilometers. A good walker makes it in four hours walking time. The way is very easy to find. When I made it, I met only a Czech couple who did the hike, but masses of (mostly) Javanese tourists who hired either a jeep or came on motorbikes. Because of the heavy traffic with it's smog and dust it's not really healthy to do that walk. Without the traffic it would be a fabulous hike with a lot of different viewpoints and absolute quietness around - only the wind would be to hear. So the hike is dominated by motorized traffic, like everywhere else. 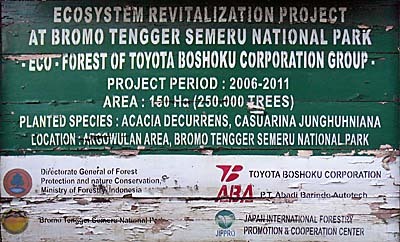 The national park (declared Bromo-Tengger-Semeru National Park in 1982, under protection since 1919) is now sponsored by the car industry, namely Toyota. Therefore there is no reasonable transport system established for all the many tourists who come every day to visit the park. 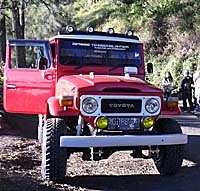 The tourist industries are equipped with masses of Toyota jeeps, who produce heavy traffic in the sand desert up to Penanjakan. Javanese are not particularly enjoying a walk. In fact, they wouldn't walk a meter if they could use a vehicle instead. They always come in big groups an appear rather noisy. All the permanantly bypassing jeeps cause a lot of smog and, moreover, dust pollution in the national park. That's a contribution for the sake of Toyota's business success. 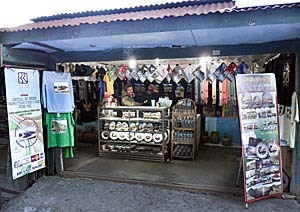 By the way: here on Java the tourist industries always emphasize the sunrises. I got to hear it many times, that it is a 'must' to see the sunrise at certain places, as in Borobodur, on Mount Merapi, the Dieng Plateau, here in Bromo-Tengger-Semeru National Park and other places. That's just marketing for the tourist industries itself, because then they can sell expensive tours and guides. In fact it's not worth to go up at 3 a.m. to rush for a sunrise. It's always sufficient to go up with the sun, what is here from 5 a.m. on. Then one can make all the trips without a guide and without a booked tour. In daylight it's possible to find the right way even as a stranger. And the light is on sunny days mostly pleasant, so long the sun is not to high on the sky - that's until 10 a.m. - 11 a.m. The mass of the people comes here for only a daytrip and then they rush further. But the landscapes are phantastic and offer the possibilities for several daytrips. Therefore it's advisable to stay here for a couple of days and exploring the surroundings somewhat further. It's said there was a principality here in the 15th century, with a noble couple at the top of the state. It was called Tengger, as the people living around are still called today. The noble couple could not get children, so they went up on Mount Bromo to ask the gods for help. The god's helped under the condition, that they had to sacrifice their last child. So, much later, they threw their 25th child [!] into the crater. The child's voice appeared then and ordered the people to hold an annual festivity. That's the mystical reason for what the people do now every year. It's called the 'Kassada', and they sacrifice food, flowers and livestock. For this purpose the hindu temple at Bromo's foot was built - it serves as a starting point for the annual procession up to the mountain. Festivities like that are also common in Bali, with it's Hindu population. These mythologies together with many others who are still around here in Indonesia are explanations of the past, when people didn't know anything about geology and science. Now, in the 21st century, this kind of explanation is outdated since centuries. Though, still a majority of people here believes the old, religious myths. There are ten major tectonic plates on earth. The earth is mostly a hot, liquid planet; only on the outermost crust it's firm. 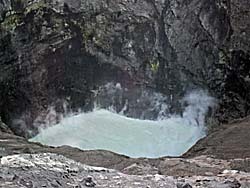 The tectonic plates are 'swimming' on the liquid below, and at several places they squeeze against each other. Here on Java the Australian plate is pressing against the Euroasian plate, sliding under it with an average speed of the growth of fingernails, what is some 12 centimeters a year. At the edges of the plates the pressure piles up mountains in long-term and causes earthquakes from time to time, when the pressure grows too big. Whole Java came out of the sea due to these movements. These plates edges also are partially open connections to the inner, liquid part of the earth. When pressure grows, volcanos break out in eruptions, and part of the liquid from inside the earth is coming to the surface.